We fear mercy because we feel the “world” will get the wrong message and find in mercy the permission to sin. The problem here is that the world has already found the permission to sin, even believes it needs none. It may be true that some define mercy as mere acceptance and thus want “mercy” without repentance, but growing (sometimes slowly and painfully) in one’s understanding of mercy is part of the journey of faith and a risk that Christians must be willing to take. None of us come to Christ fully formed, free of sin, having fully repented, ready now for the mercy that we no longer need. Who of us is not still learning about the great mercy offered to us? The world already has the wrong message. Mercy is a key part of the right message. Offering mercy is integral to the Christian life. We fear mercy because we fear the Church will crumble if we let mercy too quickly out of the bag. This is related to fear #1. We fear people will get the wrong idea about sin if we offer mercy, even Christians will get the wrong idea, and next thing you know the Church is filled with folks reveling in their mercy by glorifying sin (or reveling in their sin by glorifying mercy). This comes from seeing mercy as analogous to no-strings-attached freedom. But that, of course, is not true. Mercy is love’s response to sin. Mercy, by definition, takes into account sin, acknowledges it, calls it out. But mercy also, and in spite of sin, extends the hand, welcomes the sinner. Mercy requires faith, which is to say offering mercy begins with trusting God. The truth is, the Church will crumble if we don’t offer mercy. Lack of mercy points to lack of trusting God. Perhaps we fear offering mercy because we believe we understand mercy more than we do. We fear mercy because we demand justice (meted out on others). Justice is a good thing. We look to God to bring about justice. But if all we have is justice then we’re all sunk — the upstanding deacon is just as sunk as the suspected gay choir leader, as is the marxist activist, as is the little old lady praying her rosary, as is the pope himself. None of us wants justice if it includes ourselves. But we fear mercy if it means that others will not get the justice we know they deserve. We are desperate for justice in this world. Sin makes us hate others, and demanding justice can too easily be the blessing we bestow on our own hate. What we must recognize is that we, all of us, are still desperate for mercy for ourselves — and not merely at an emotional level, for without mercy there is no salvation. The saints have all known this. The Pharisee and tax collector: Who shows mercy? Who does not? God shows mercy. The Pharisee does not. 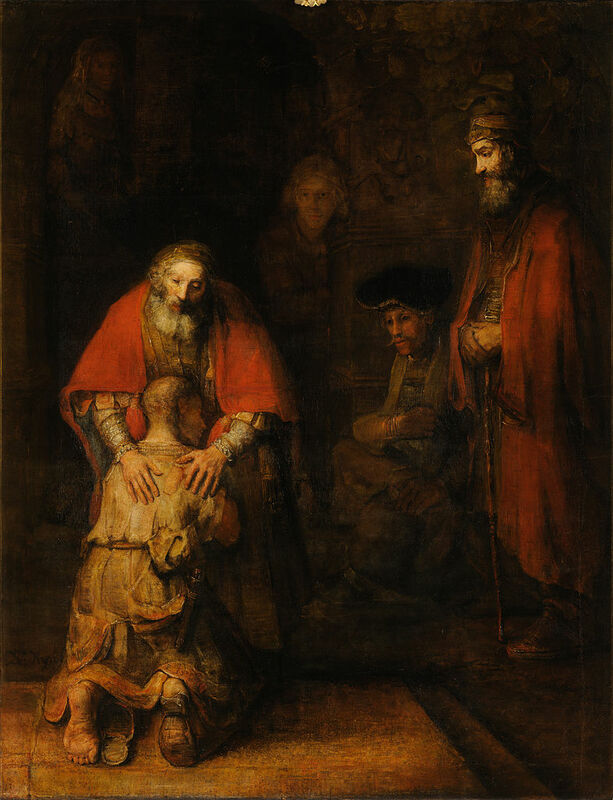 The prodigal son: Who shows mercy? Who does not? The father shows mercy. The eldest son does not. The woman caught in adultery: Who shows mercy? Who does not? Christ shows mercy. The Pharisees do not. Will we show mercy? Showing mercy requires faith in God. Do we trust in faith, in God’s mercy, in God’s sovereignty? Are we willing to let God fight our battles? God will fight our battles. That is the story of the Old Testament, reiterated in the new. We claim faith, hope, love… and God fights our battles. Remember faith, hope, love abide, these three; but the greatest of these is love. Let God have the big picture as well as the small, let Him fight the battles, and let us show mercy — for God will also show mercy. Mercy is love’s response to sin. God is love. We are His children.